Dianne Kellogg studied watercolours with Florian K. Lawton (1921 – 2011), an American visual artist and a realist painter who painted Amish rural life near her home in Northeastern Ohio. His influence informs her eye for detail and interest in the natural world. 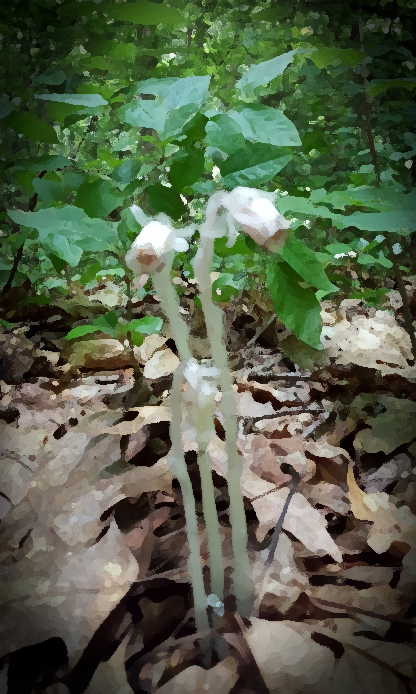 This artwork of ghost pipes, or Monotropa uniflora as they are known by their Latin classification, was discovered in the undergrowth near her Pennsylvania cabin. In June 2017, she added it to her collection of fungi photos only to find that it was actually flora similar to mistletoe. Kellogg has manipulated the photo taken with a Galaxy VI mobile telephone by using halo and dry brush effects in Adobe Photoshop to create the digital image.